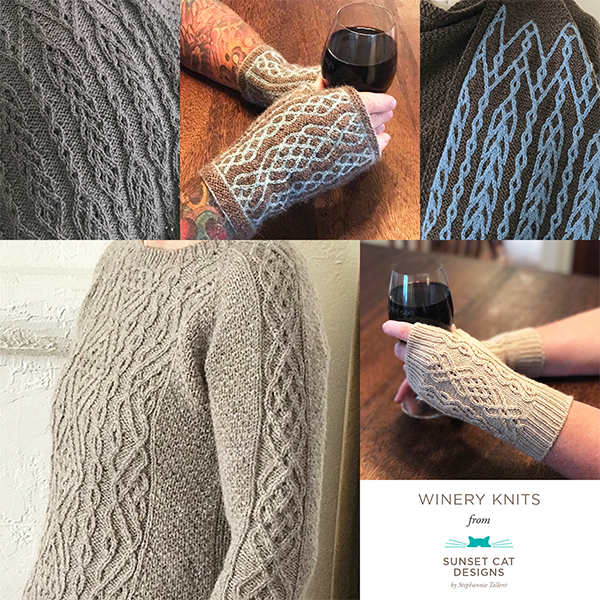 All self-published mitten or sock patterns with errata are listed below in alphabetical order. 02/18/16: Updated size Medium Cuff chart. 02/20/16: 1st cable cross Round 3 Size Large is 2/2 LC. Chart is worked flat. Legend shows stitches with RS definition only. Row 1 (RS): K2, [p1, k1] four times, k1. Row 2 (WS): P2, k2, p1, k1, p1, k2, p2. Row 3: K2, p1, [k1, m1] four times, k1, p1, k2. Row 4: P2, k1, p9, k1, p2. Row 5: K2, p1, k2tog, yo, k2, yo, skp, k1, yo, skp, p1, k2. Row 6: P2, k1, p9, k1, p2. Row 7: K2, p1, k2tog, yo, k1, 3/3LLC, p1, k2. Row 8: P2, k1, p9, k1, p2. Row 9: K2, p1, k2tog, yo, k1, k2tog, yo, k2, yo, skp, p1, k2. Row 10: P2, k1, p9, k1, p2. Row 11: K2, p1, 3/3Row LC, k1, yo, skp, p1, k2. Row 12: P2, k1, p9, k1, p2. Row 13: K2, p1, k2tog, k1, BO 3 times, k1, skp, p1, k2. Row 14: P2, k1, p2, 1, p2, k1, p2. Row 15: K2, p1, k2tog, k1, skp, p1, k2. Row 16: P2, k1, p3, k1, p2. Row 17: K2, p1, cdd, p1, k2. Row 18: P2, k3, p2. Note that the first 27 and last 2 sts (a purl & a knit stitch) of the initially cast on round will be the instep sts. 11/12/2015: Large left mitt: stitch column 45, round 27: Stitch should be rki in CC rather than simply knit in cc. Corrected in 11/12/15 version. 12/28/14: For Aran Weight, placement of side markers. : Join in the round and pm for beginning of round. K15 (17, 19) sts, pm for side marker, knit to end of round. Correction to bead placement on hand chart: Beads added Row 46, stitch 20 & Row 48, stitch 22; bead removed Row 47, stitch 21. 8/25/14: New version on Ravelry includes line by line instructions. These are line by line instructions for each chart. Work each complete round as directed in the written portion of the pattern, pages 2-3. Also includes missing abbreviations. (prior to 01/16/11, in both the single pattern and Mittens! e-book and booklet): For Ocotillo line-by-line, cast on 16 sts for Wide Cuff, 15 sts for Narrow Cuff. 3/13/15: Size Large Ribbing and Leg Chart had the wrong cable between sts 2-10; should have been a 4/3 LC rib on Rounds 3, 10, 17, 24, 31, 38, and 45. Updated instructions to include mirroring the side cables of the Ribbing and Leg Charts. Right mitten: Round 1: Work the front of the mitten using Right Hand Chart, k2, PM, k2, PM, knit to end. Right Hand Chart & Written Instructions: Round 14: P1, (k tbl) 2 times, k6, k tbl, p1, k1, p1, k1, p1, k1, p1, k1, k tbl, k4, (k tbl) 2 times, p1.